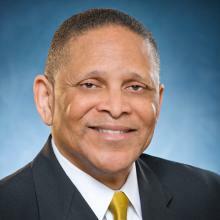 Walter L. Sutton, Jr., served as Associate General Counsel - Legal Administration and External Relations at Wal-mart Stores, Inc. In this position, Sutton was an internal advocate for the Legal Department’s diversity initiatives. He also collaborated with external stakeholders to promote diversity within the legal profession and the pipeline for future attorneys. Prior to joining Walmart in 2005, Sutton practiced law for 35 years in Detroit; Houston; Washington, D.C.; and Dallas. He is a member of the ABA Standing Committee on Government Affairs; a member of the Board of Directors of the National Judicial College; and a member of the Board of Directors and Chair of the Finance Committee of the American Bar Foundation. In addition, he serves as Chairman of the Board of Trustees of Wiley College (“Home of the Great Debaters”), a historically Black college in Marshall, TX. Sutton earned his B.S. in Business Administration from the University of Denver, his Juris Doctor from the University of Michigan Law School, his MBA from the University of Dallas, and his Ph.D. in Management Science from the University of Texas at Dallas. Sutton is a former member of the IAALS Board of Advisors. IAALS Advances Justice with Dr. Walter L. Sutton, Jr.